How to Lose 30 pounds the Healthy Way at Hitch Fit Gym! How to Lose 30 Pounds the Healthy Way! Home/Success Stories/How to Lose 30 Pounds the Healthy Way! 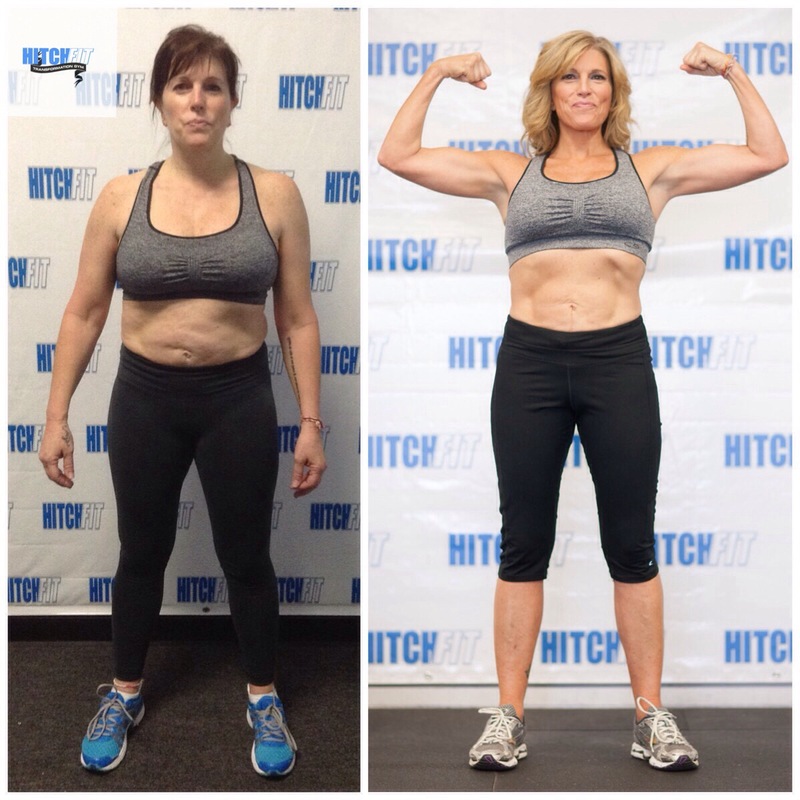 Kim Gets the Lifestyle Transformation she’s Always wanted while Losing 30 lbs and 9% Body Fat! Lifestyle transformation and 30 pounds of body fat lost! 30 Pounds of weight lost and a healthy lifestyle gained! 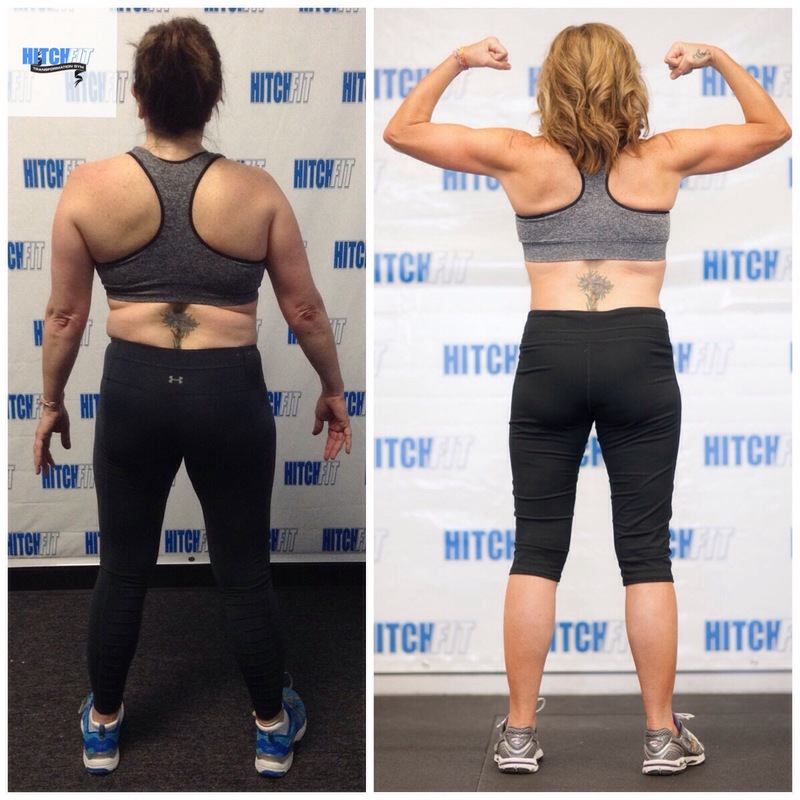 Before and After Transformation at Hitch Fit gym Overland Park! 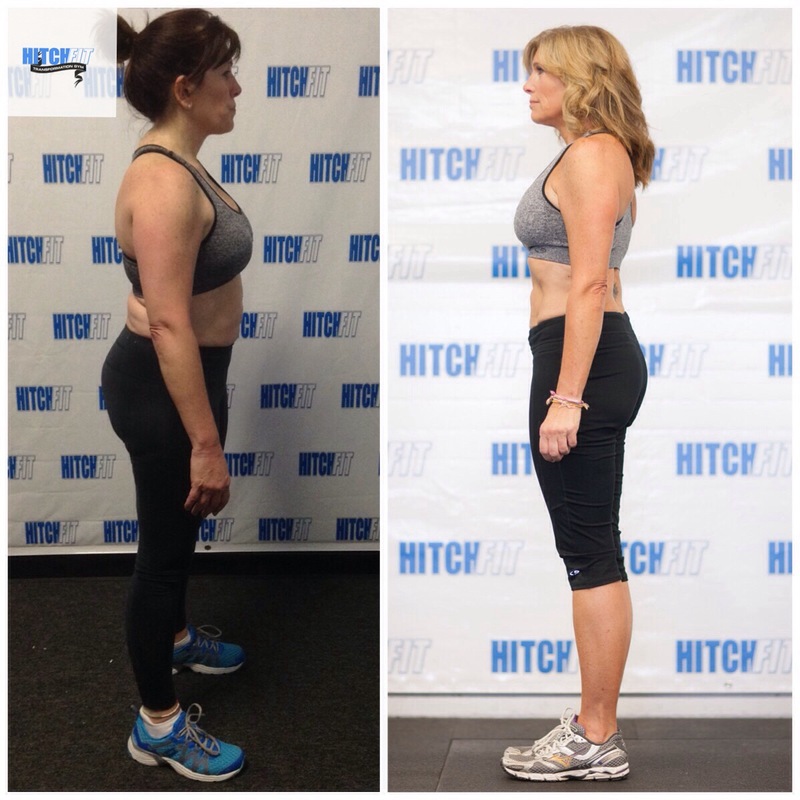 Hitch Fit Gym personal trainer Amy Gipson with her client Kim after she lost 30 pounds! “My name is Kim Miller and I have never been in better physical condition in my life! I’ve never been much of an athlete, I swam on the “B” team and was a cheerleader in high school, nor was I a conscientious eater. Quite the opposite. Back in those days I survived primarily on Dr. Pepper and salt and vinegar chips. For the most part, over the years, not much changed. Of course I would diet or exercise in phases. Typically right after a holiday or immediately before an event that might require me to wear something flattering I would find the latest fad and jump on the bandwagon. You name it, Adkins, South Beach, cabbage soup, etc. I tried it. Couch to 5K, P90X, whatever, I tried them. Most of the time they worked to a degree and deep down I knew I needed to be healthier; I just couldn’t make it stick. So I would lose and gain and if all else failed, I starved myself, I could take weight off when I needed too only to put it right back on. Eventually, as time passed and I neared 50 years old, it not only became impossible to “shave off a few pounds” via starvation, I was actually gradually gaining weight in spite of my old tried and true ways. I felt myself becoming more and more disappointed and depressed. No one around me cared what I looked like. They all loved me and expressed that constantly. My doctor wasn’t warning me to get in better shape or improve my eating habits or face the consequences. Yet I felt self-conscious and sad. I refused to wear anything that might show my figure and passed on opportunities that might call for me to put on a bathing suit. This sadness and depression was impacting everyone around me and I finally came to the decision that I MUST change myself FOR myself! I researched exercise, fitness and physical transformation and came upon Hitch Fit. Quite by coincidence or perhaps divine intervention I ran across a Groupon for a few sessions with my local Hitch Fit gym and I never hesitated. I made my appointment and within days met Amy. I was so eager to transform that I signed up with Amy that very first meeting. Initially it was hard. I was sore from all the new exercises that worked muscles I didn’t even know I had. I had to forego foods that I had been eating all my life but Amy was inspirational. She educated me and gave me the tools I needed to get through the rough spots and if I felt unsure or had a moment of weakness just a quick text and Amy had me right back in the correct frame of mind! She was always there for me in an instant and pushed me with just the right level of insistence. She knew where my individual “zone” was and she kept me there even through some difficult setbacks, the hardest of which was an ankle injury just a couple weeks into my transformation. She never blinked. She gave me the exercises I needed to work around my injury and the motivation I needed to power through. Although I think my family might’ve initially been skeptical, they’d been here before, they quickly saw the determination and dedication and became incredibly supportive. The Hitch Fit facility is comfortable, just the right size for me and I look forward to my workouts there. Everyone is positive and motivating. Ultimately, for me, this was the perfect confluence of desire, tools, support and methodology to transform myself; the right person to teach me the skills required and lead me through that transformation in the right environment and nutrition under an umbrella of support from my family and friends including my trainer who doubles as my new friend and inspiration, Amy Gipson. Now that I have the confidence and discipline provided by Amy and Hitch Fit I know I will continue to eat properly, train hard and regularly and I believe the rest of my life will be an ongoing joyous transformation!